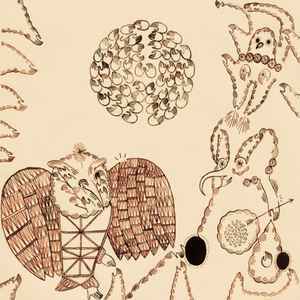 Cover reverse contains a folded sheet with sketches and all lyrics drawn by Devendra Banhart. Folded sheet reports the complete title: "Rejoicing In The Hands Of The Golden Empires". Marc Bolan Marc Bolan Marc Bolan there is was will forever be already a Marc Bolan - what where when is your voice, Banhart, your unique voice that does not lean on Marc Bolan's voice? dəˈrivədiv.